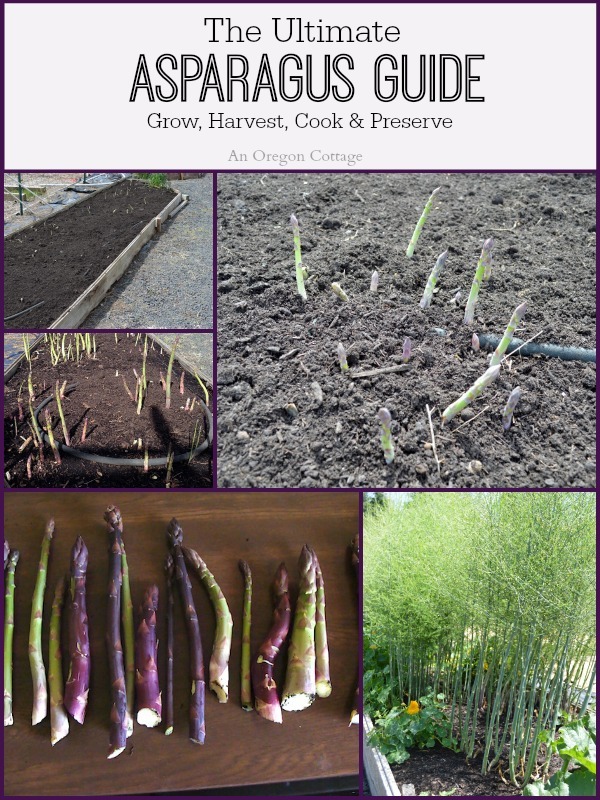 Ultimate asparagus guide with basic growing information & tips from a 10 year old patch, how to harvest and preserve, plus many cooking recipes. 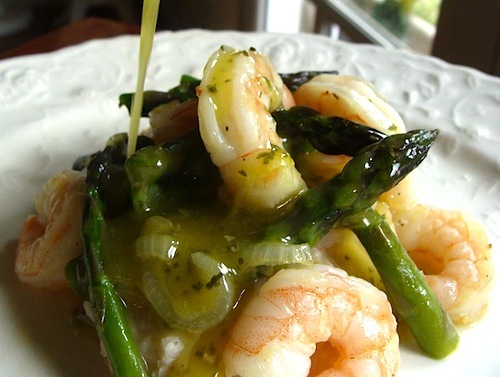 Asparagus is a fantastic vegetable to grow if you have the room- though it takes a few years to become established, once it does it’s a fairly low-maintenance food crop. It can also be successfully grown in most parts of the US (mild, wet areas like Florida are about the only places it doesn’t do well). And those first spears of spring? It’s a joy to behold, really, signaling the start of a new gardening season and tasting so fresh and tender, you won’t believe it. My asparagus patch is a decade old and provides our family with heaps of asparagus (sometimes too much…) in the spring and makes a nice green hedge for one side of our vegetable garden the rest of the season. 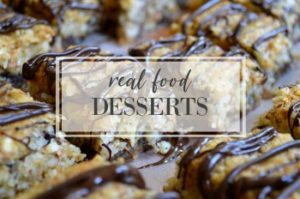 Since I get a ton of questions about this crop from both blog readers and garden visitors, I thought I’d put together a resource similar to our Ultimate Rhubarb Guide – an asparagus guide where you can find basics on growing, and harvesting asparagus, plus a source of great recipes for preserving and cooking with asparagus. 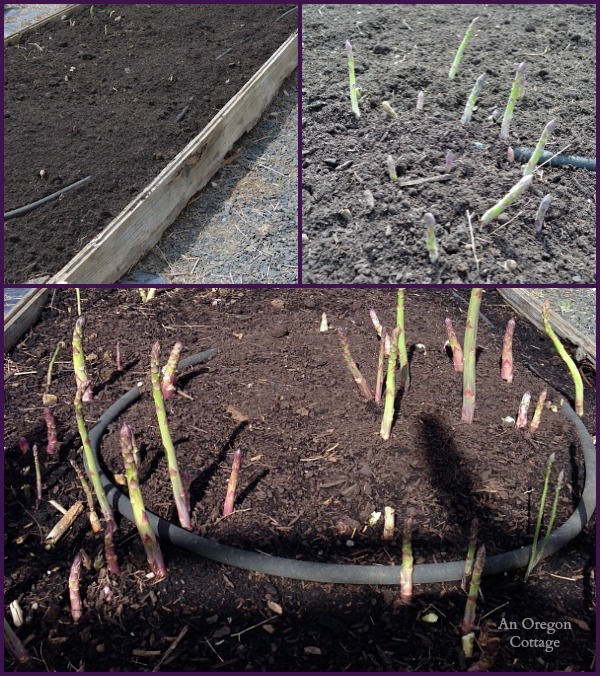 Start with 1-year old asparagus “crowns” (they have long, fleshy roots) which you can find at nurseries and online in early spring. I recommend choosing an all-male variety (like ‘Jersey Knight’) which I thought I was getting when I ordered online, but I’ve found that most of my plants are female and they produce a TON of berries that reseed little asparagus plants all over the garden. Ugh. The all-male varieties also will produce more spears as they aren’t trying to produce berries. I grow both green and purple varieties, and have found the purple to be quite hardy with thicker stems (fyi: the purple asparagus turns green when cooked). 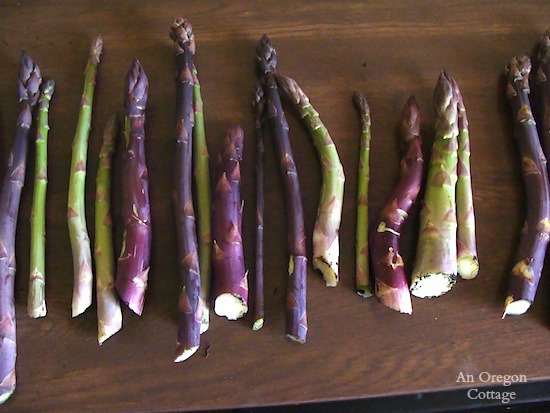 Pick your asparagus bed wisely – you will not want to disturb the roots and the patch can grow for 20 years or more! They need full sun and NO weeds to compete with their roots. They also need really good drainage and to be planted in a trench, which is why I suggest planting in a raised bed (additional tip: do not plant anywhere near raspberries or other aggressive berry, as they can take over an asparagus bed and kill it). Amend your soil with manure or compost, dig a 6-inch deep trench, plant the crowns 18 inches apart and then cover with 3 inches of soil. Water and fill in the trench as the plants grow. Mulch the surface well to keep those weeds away and let the spears grow and produce their ferny foliage. 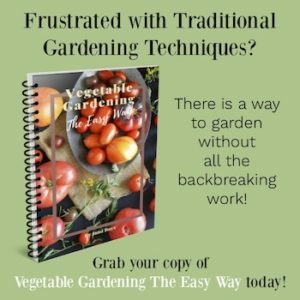 The foliage will brown and fall over in the late fall, and Organic Gardening suggests leaving it over the winter to help protect the beds, cutting it off in the early spring before the new shoots appear. And that’s about it for this perennial food crop! From planting on, it will only require basic maintenance: keep weed-free, water regularly, feed in spring with a top coating of barnyard compost, and cut down the brown fronds in the early spring. One more tip: the roots of asparagus don’t like competition, so I don’t try to plant any other crop in the bed with it. I do let nasturtiums reseed in the front of the bed, removing any that try to grow on or near a producing crown, but that’s about it. I’ve read recommendations from 10-25 plants for a family of four, but really what if not everyone in your family likes asparagus? Or some like it too much? And you might be limited by space, too. Our example: we planted 2 20′ x 3′ raised beds with about 12 crowns in each. In the beginning, it seemed a good amount, but now it provides too much asparagus for our family and I realize just one bed would’ve been enough. However, it’s fun to give it away and this year I even sold some. So basically, you decide based on your needs and space! It takes awhile to grow a decent asparagus patch –plan on not really harvesting much of anything for the first 2-3 years after planting. If your plants look really healthy in the second year, it’s probably okay to harvest a handful of spears just to get a little reward. 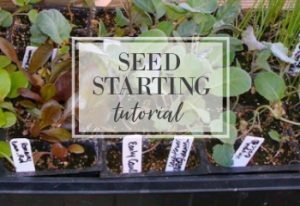 In the third year, pick for only the first 2-3 weeks in spring after they start growing (less if it doesn’t seem like there are many of them). Once your patch is established, harvest only for about 6-8 weeks in spring (some sources only say 2-3 weeks, but I’ve found it’s okay to go with the longer harvest – my patch is healthy and strong even with the longer harvest) and then you need to let the spears grow to produce tall, ferny foliage. Harvesting for only a season of time is important to the health and longevity of the plant – letting it grow feeds the roots and creates bigger and stronger plants. To harvest: snap or cut the spear off close to ground level. I find it easiest to just snap them off – especially because I’ve cut too many newly growing spears by accident when using a knife. In all my years of growing asparagus, I’ve found that the spears are never all the same size – there will be thick spears and super thin ones from the same root from the very beginning of the harvest. So the often repeated recommendation to “harvest until most of the spears are smaller than a pencil” doesn’t really work for me, which is why I use the 6-8 weeks rule. During the harvest period, don’t let any spears grow – keep the whole patch cut down. That means you will need cut some too-tiny or malformed spears and just compost them. Alternate Fall Harvest Time Period: some people want to get a fall harvest as well as a spring. To do this, divide your patch in half, harvest one side in the spring and let the spears in the other half grow in spring without ever harvesting them. Then cut down all the ferns on the fall side in August – you should be able to harvest the spears as they appear in September and October. They grow to a HUGE 6-ft tall hedge at the height of the summer! 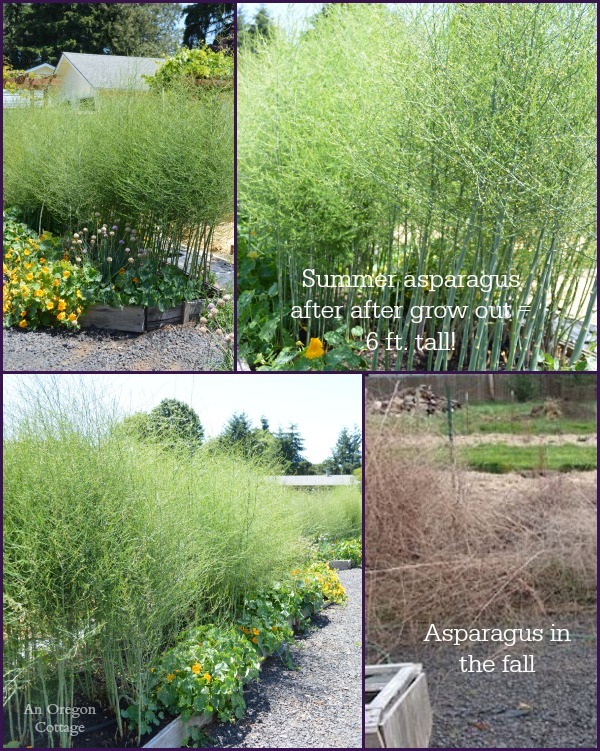 When people see my garden in July, the number one question I always get is “what is that?” when pointing to the asparagus hedge because most aren’t very familiar with what asparagus looks like as it grows. I know I didn’t have a clue before I started growing it, and it never ceases to amaze me. Lucky you, Jerica, to have an established patch! Yes, you want to remove those canes asap – the new shoots will be coming up soon (depending on where you live) and you’ll want to be able to pick them easily and take care of the bed. I will warn you that the brown canes are tough – I’m not sure a weed eater will cut them. I used our hedge-trimmer. If you see any new shoots already coming up, you’ll want to trim them higher than the shoots so you don’t damage any. After trimming to a few inches, you can go through by hand and bend over and break off the brown stems left to clean up. It’s really the only way to remove them completely. Add a good layer of weed-free garden compost (which will feed and reinvigorate the soil as well as keep down weeds) and wait for the shoots to appear. Hope that’s helpful! Thank you so much for writing this article! My husband and I are planning our garden and I keep saying the asparagus needs to go in the back (as I’ve read) due to the ferns. Yours is the first time I’ve seen good pictures of how big they get – I think he will now understand what I’m talking about! Wish me luck! thank you for this! I have five 8×3 raised beds and I’ve been thinking about dedicating one of them to asparagus. This is awesome information and I really appreciate it! You’ll be able to harvest a good amount of asparagus from that size bed, Karen! LOL, had to laugh when this article popped up in my email. I planted asparagus this year just on a lark, saw the package in the garden center and it said grows well by rhubarb. It sprouted recently and I though, hmm, I need to do some research on what to do with it and care for it, and voilà, your article pops up. Thank you for the great information and your great blog, I have been a fan for many years since I found your artisan bread recipe.